I'm often asked by parents searching for a diagnosis if their child's particular symptoms--usually listed off like specs on a new car, so ingrained are they in life with a sick child and no answers--sound like Mitochondrial Disease. Sometimes it is asked in the obvious context of their wanting to hear, "Absolutely not, it can't be Mito," and other times they have reached a point in the search where they want nothing more than to hear, "Definitely it HAS to be Mito," just so they can have an answer. Unfortunately, the reality is quite simply not that cut and dry. In fact, my first piece of advice to most parents new to all of this is if they see a doctor who tells them that their child cannot have Mito or definitely has Mito based on symptoms and history alone, it is time to find another doctor. Nobody, not even the best doctors out there, can look at a child and pass down a final judgment on Mito based solely on symptoms without a complex set of test results in hand. Mito is a mimic, able to masquerade as hundreds of other more common diseases. Often children will be misdiagnosed with one of these more likely suspects for years before a new symptom takes the initial diagnosis off the table and initiates a new hunt for answers. Other times children are handed the painful label of "undiagnosed" before a particularly astute doctor thinks to check for Mito. There is a saying that doctors are taught to look for horses not zebras when they hear hoofbeats in Central Park. Mito is the medical equivalent of a green and blue zebra and it is exactly that fact that makes the journey to diagnosis so arduous for some families. Many children with Mito end up stuck in a vicious cycle with their doctors busy treating all the symptoms and nobody trying to figure out the common denominator or root cause of everything. This is why Mito often flies below the radar for so long before it is diagnosed. In order to understand why I can't simply list the symptoms of Mito, you have to first understand how it develops. In most genetic cases, Mito is there from conception. In those critical first few days after conception when cells are rapidly dividing, the good and bad mitochondria in an affected child are divvied up, so to speak. It is a total roll of the dice as to where the good mitochondria and the bad mitochondria end up. That bunch of cells will soon split up and develop into different parts of the body--some will be the brain, the stomach, the heart, the eyes, the liver, etc. What part of the body is affected all depends on which of those early cells had the greatest concentrations of bad mitochondria. This is why some children with Mito can have perfectly healthy hearts but have devastating neurological disease, or vice versa. All this said, there are certain parts of the body that are more susceptible to the effects of Mitochondrial Disease. The organs that require the most energy obviously will start to flounder first in the presence of an energy deficiency, which is what Mito is. The biggest energy user in the body, especially in the early years, is the brain, so neurological disease is very common in children with Mito. Muscles, too, are very susceptible, and weakness or muscle problems are seen commonly. The heart is another high energy organ, as is the liver. The eyes are frequent targets as they also use a lot of energy. While these systems are more commonly affected (in just about any way imaginable), everything else is fair game as well, all depending on the first few days of development, and where the bad mitochondria wound up. So you see I could list out the symptoms of Mitochondrial Disease but you would be left with a three page list of every possible symptom out there. Mito does not hide in the symptoms, it hides in the bloodwork. A doctor cannot form an opinion on the possibility of a child having Mito without at least having some basic metabolic testing in front of him. What are the symptoms of Mitochondrial Disease? This is not the question one should ask. Rather, one should ask, in what situation should we consider Mitochondrial Disease? This question I can answer: when a child has multiple symptoms, with multiple organ systems involved, but no unifying answer to it all, it is time to consider Mito. 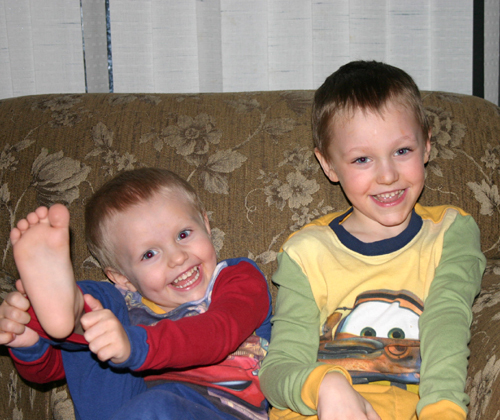 Keely Schellenberg and her husband Dave live in Canada and have two boys, Brandon and Tyler. Brandon has confirmed complex 1 deficiency and Tyler is suspected at this point but not confirmed.